See Cello, our Dock Diving Diva, in action by clicking HERE! 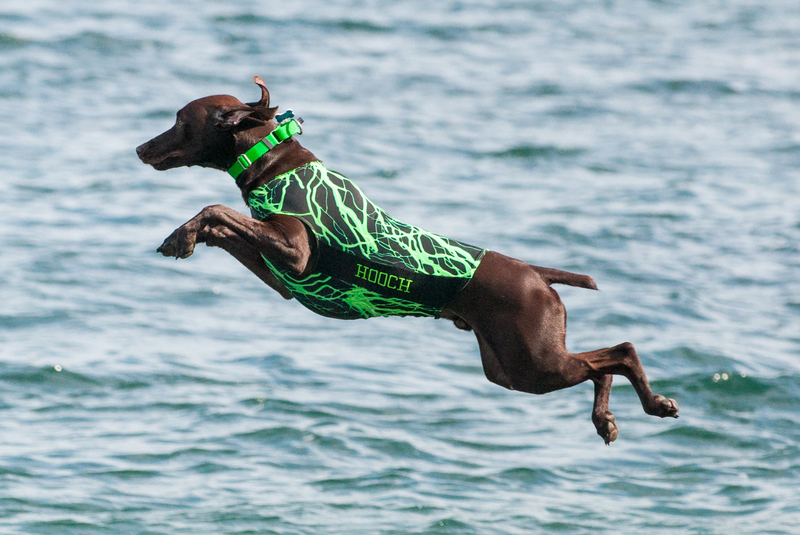 See Hooch, our Dock Diving Dude, in action by clicking HERE! 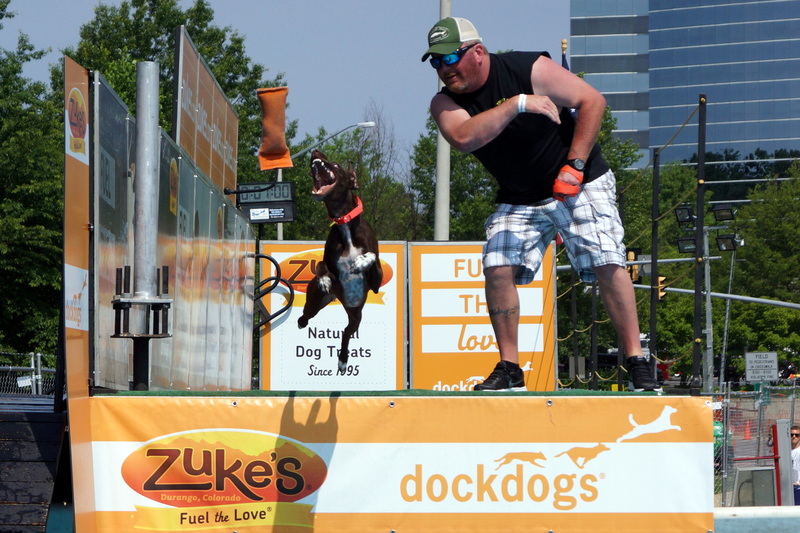 See Lager, our Deployed Dock Diving Dawg, in action by clicking HERE! See Whiskey, from Dumped to Dock Dock Diver, in action by clicking HERE! Read Below to learn more about this exciting sport and the DockDogs organization! Dock Diving is a fast growing and very popular sport in the United States and Canada which has been featured on ESPN and The Outdoor Channel. Dock Diving is open to dogs of all sizes and breeds. The only requirement is dogs must be 6 months old. 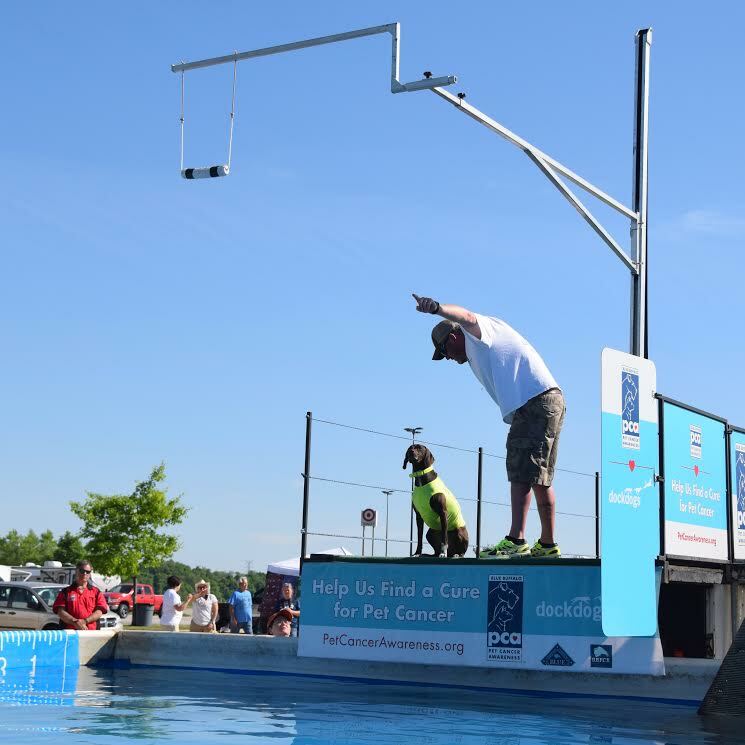 There are several organizations that host dock diving events, such as DockDogs, Ultimate Air Dogs, North American Diving Dogs, and Splash Dogs. Each organizations has their own rules and versions of the competitive disciplines, so be sure to read the organization’s website for specifics. 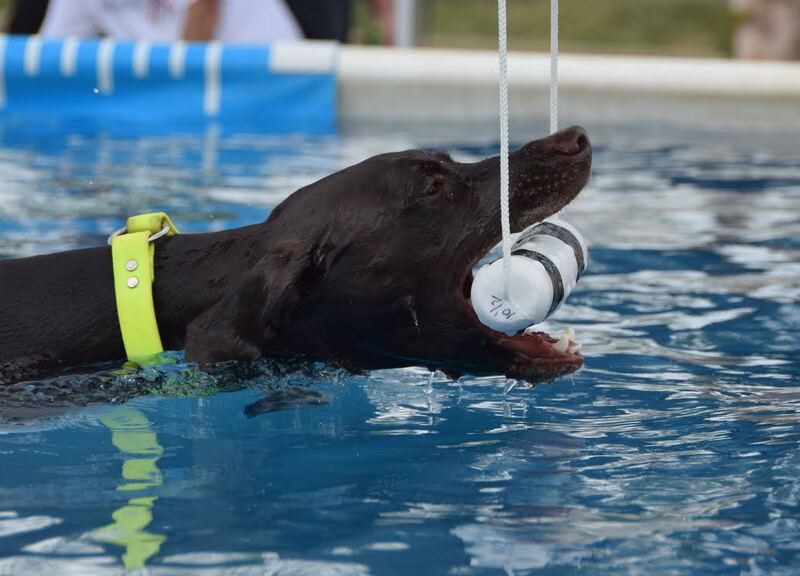 Our dogs participate in DockDogs events. 1. Big Air (BA) …the Long Jump! This is the event that most often comes to mind when people think DockDogs. Best described as a long jump for dogs, it is the most popular of the three disciplines, and dogs are judged based on how far they jump. A floatable toy or object is thrown into the water and the dogs may use the entire 40 feet of dock to run and jump in the pool. You may NOT push or throw your dog into the pool. Handlers and dogs are given 60 seconds on the dock. Distance is measured from the end of the dock to where the base of the dog’s tail enters the water. 2) Extreme Vertical (EV) …The High Jump! 3) Speed Retrieve (SR) …The Sprint! Speed Retrieve involves running, jumping and swimming. A bumper is hung at the end of the pool or 38′ from the dock in lake/pond events. The handler places the dog at the 20ft. mark on the dock. Once set, the handler notifies that they are ready. 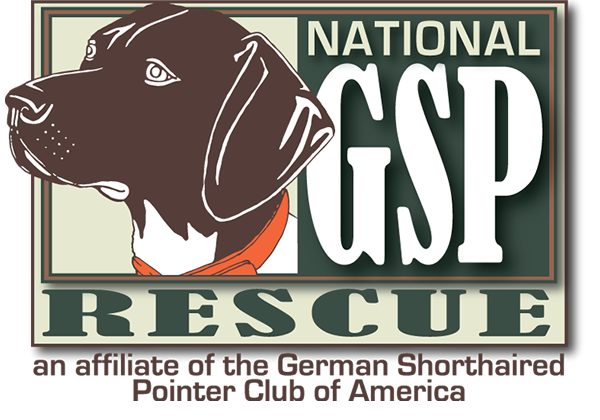 When given the signal (“Go” command), the handler releases the dog, who runs, jumps from the dock, and swims and grabs the bumper. Retrieving the bumper is not a requirement, but the bumper must be cleanly released from the extender. Time is recorded from the signal to when the bumper is completely released from the hanging apparatus. 5) Dueling Dogs …The Drag Race! This new discipline, Dueling Dogs, was unveiled at the 2014 World Championships, and was showcased at the first 2015 Regional Event! An Iron Dog is one who competes in all disciplines above. Points are awarded based on scores achieved. You must enter at least one wave in all three disciplines to qualify, and must register as an Iron Dog. Have doubts that your pup won’t jump? Check out this video of Hooch – he went from being afraid of the water, to jumping over 24 feet in a matter of just a couple of months! Basic Obedience: All athletic dogs must be experts in basic obedience. That is, they must follow your commands and signals (sit, stay, stand, heel, etc.) without fail and not be distracted by other people, dogs, or activity around them. 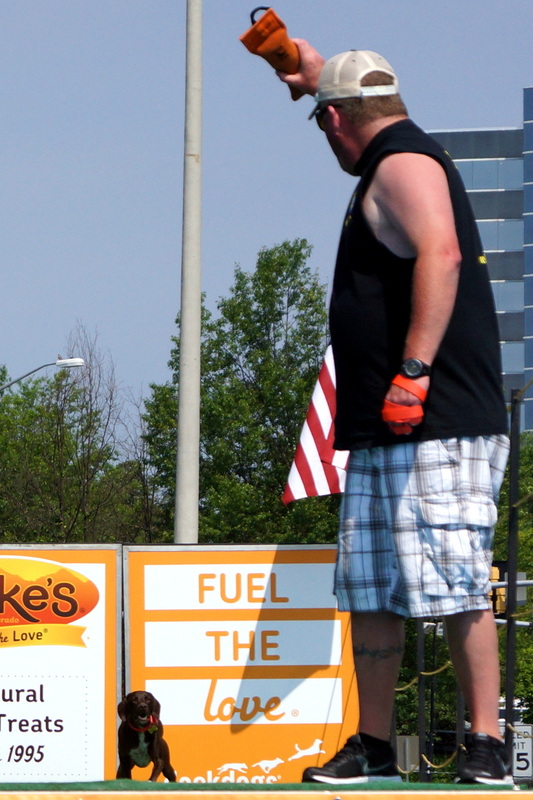 Conditioning: Both dog and handler must be in top physical condition to compete in most dog sports. Fetch: Successful dock diving must be very driven for their chase object (toy). 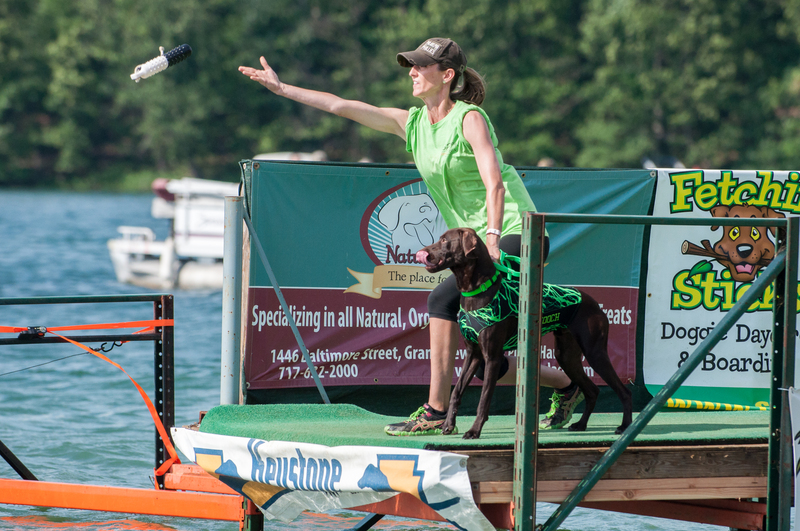 Any dog that is naturally attracted to fetching (and isn’t afraid of water) is an ideal candidate for dock dog competitions. Most dogs do have some natural retrieve drive that can be built upon with time and practice. Straight Run: The run down the dock is the first factor in achieving great jumps. Optimal speed is good, but even slower dogs can alter their jump angle to increase distance (higher launch equals longer distance. The dog must be well-trained to run a straight line down the dock path before launch. Jump: Dock Diving jump using the same skills as any long jumper – speed and a strong launch. Ideally, your dock dog will learn to contact the very end of the dock on launch, such that his or her toes actually wrap around the end of the dock to push off. The angle of the jump is another factor to be mastered. Water Work: The dog must be completely comfortable jumping into and returning from the water. 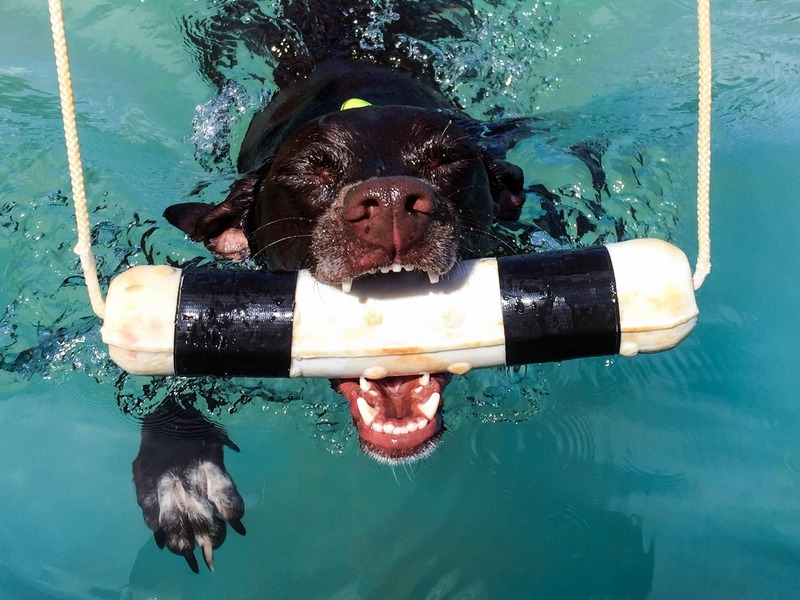 The younger a dog starts with water work, the better, though some dogs are naturally attracted to water sources regardless of age and training. Learning to focus on the chase object (rather than the water) and returning quickly to the handler are critical in successful dock dog competitions. Handler’s Throw: Believe it or not, the way the handler throws the chase object is critical. You must practice accurate tosses to the best distance for your dog, and the dog must be trained for ultimate drive to the chase object. Read more great training tips offered by Sport Mutt by clicking HERE! Dock: Competition docks are usually 40 feet long by 8 feet wide and are set 24 inches above the surface of the water. The dock is usually covered with turf-like carpet for traction and safety. Chase Object: The dog’s favorite toy, the handler throws the chase object into the water and the dog jumps to retrieve it. There are two basic techniques to dock diving, the place & send and the chase methods. The best choice for your athletic dog depends on your dog’s temperament, speed, and responsiveness to obedience commands. The simplest dock diving technique to master is the place and send. Here, the dog walks with the handler to the end of the dock and is held back while the handler tosses the toy. The dog is then returned to the start point and released or sent to retrieve the toy. Dogs that use the place and send method are generally just not trained to wait or stay on the dock themselves. It is most effective for dogs with a lot of speed that compensate for a lack of height on the launch. This method inherently encourages flat jumps, thus good speed is necessary to get the distance to compete. Dogs well-trained in basic obedience do better in dock diving competitions using the chase method. Here, the dog is placed in a stay or wait position at the starting point on the dock. The handler proceeds to the end of the dock, then releases the dog. The chase object is thrown at just the right moment to keep the toy in front of the dog’s nose all the way into the water. Thus, the dog is chasing the object! The advantage of this method is that the handler can control and optimize the launch angle to increase distance – it avoids the flat jump that is likely with the place and send method. Of course, mastering the chase method requires more time and training, and it helps if the dog is highly toy driven. Chase Method: The more advanced dock diving jumping technique that starts with the dog in wait or stay position at the starting point and the handler timing the throw to encourage the dog to chase the toy through the air. Results in more height off the launch, thus longer jump distance. 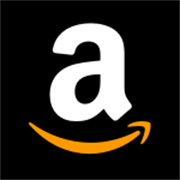 Dock: The platform from which the dock diving jump, usually 40 feet long by 8 feet wide, and placed about 24 inches above the water surface. 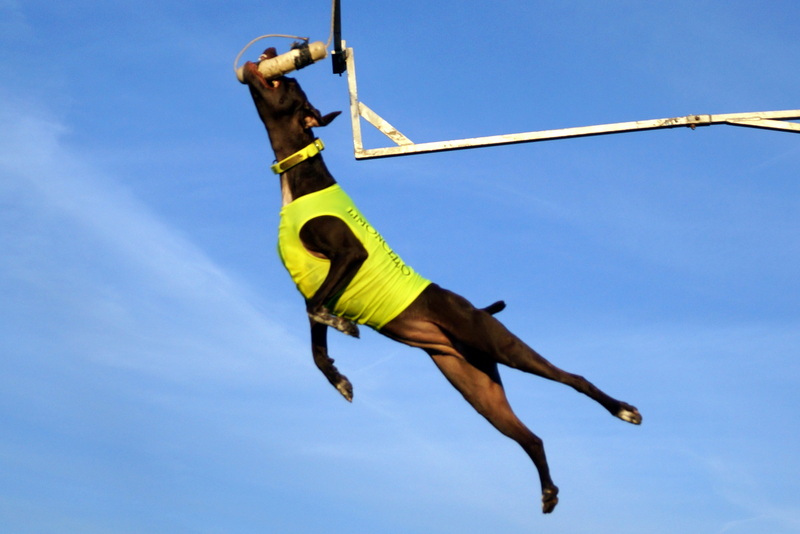 Extreme Vertical: DockDogs competitions in which dogs compete for vertical height jumps. Flat: A dog that jumps straight out at the end of the dock is said to be flat. 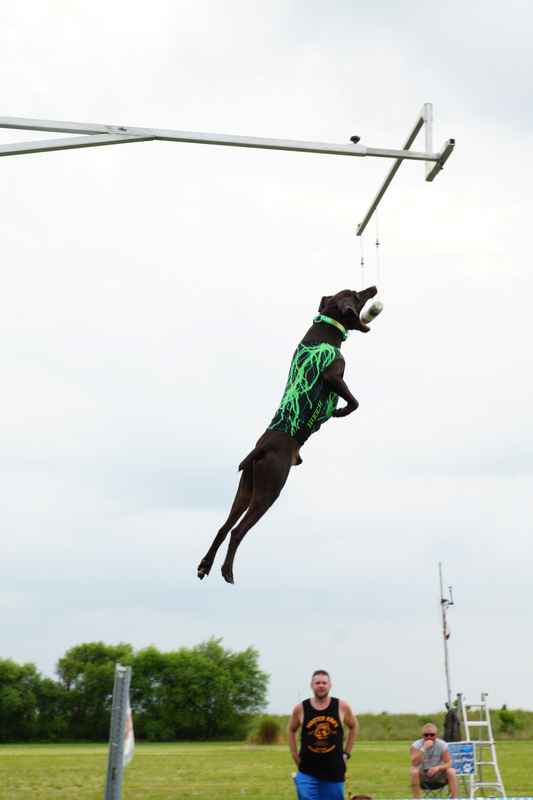 Place & Send: The basic dock diving jumping technique in which the handler throws the chase object first, then sets the dog to release and retrieve. This method tends to produce flat jumps, thus limiting the dog’s jump distance. Pool: Many dock diving events use a pool as the water source. The water must be 4 feet deep, and the length must easily accommodate the longest jumpers. Currently, the world record distance is just over 29’3″. Pop: A dog that jumps up at the end of the dock is said to have a good pop. 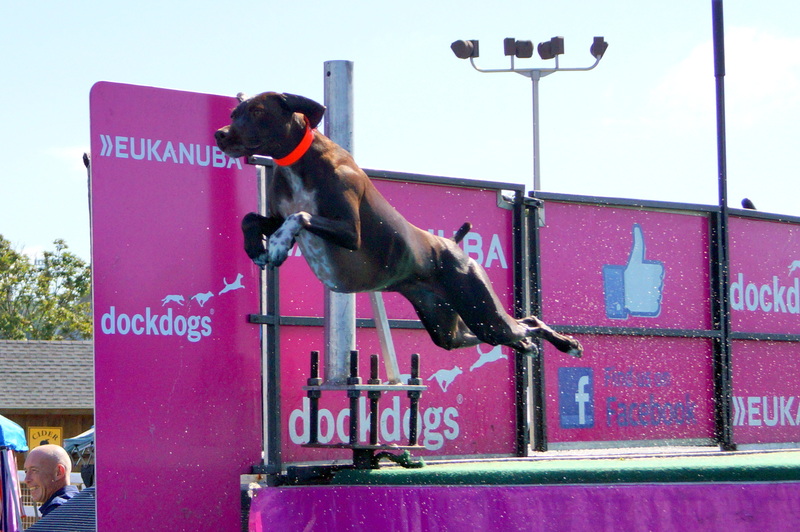 Speed Retrieve: DockDogs competitions, this sport features the dogs’ running, jumping and swimming skills. Ready for Your First Event? Each organization has an events page, and different requirements for registration. You can register for a DockDogs event on the DockDogs website, which you can access by clicing HERE. Then, just follow the prompts to register for the “waves.” You can also register for a DockDogs event on-site at the event, but if you are not there early enough, often the waves fill up quickly, and on-site registration closes. For on-site registration, you can only register for a wave held on that particular day – you may not register the day before. You can register for as many waves as you would like, and you do not need to be there every day. However, you would want to come back on the last day of the event to see if you dog made the finals. Sometimes the event provides a special parking area, or designated equipment drop off area. There will also be a designated crating area for competitors and their dogs. Once you have your canopy and crate set up, and your dog is settled, you should check in at the DockDogs admin tent. 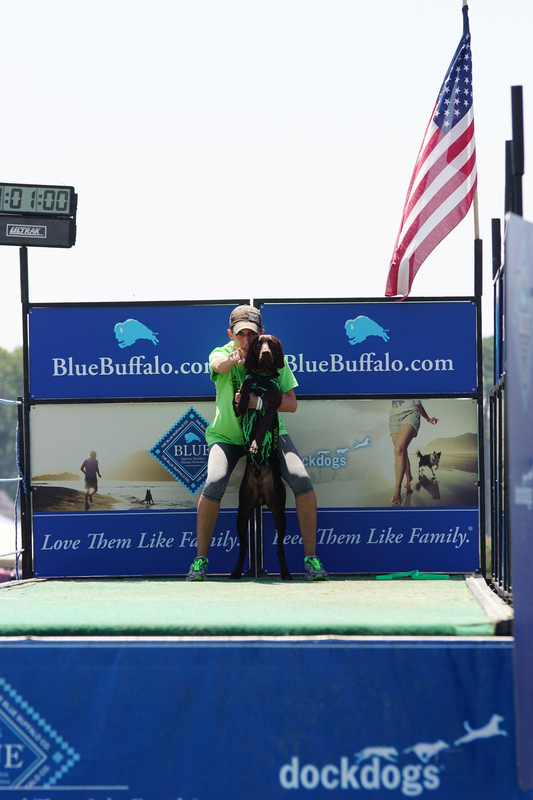 Here you will check in, sign a liability waiver, and get your handler wrist band, which allows you to be easily identified as an official competitor. The DockDogs staff at the admin tent can also answer any questions you might have. Depending on the schedule, there is usually open dock practice available. If you would like to practice with your dog, simply get in line at the steps behind the dock. Most of the time, each team is allowed two jumps, depending on how many people need to practice. About 15 minutes before your wave begins, a DockDogs staff member will call for a handlers’ meeting. Leave your dog crated for this. This meeting is mandatory for all handlers to attend, and if you are not present at this meeting, you will be scratched from the wave. During the meeting, you find out in which group you are jumping and what the jumping order is. Listen carefully so you know when you and your dog will be expected to be lined up behind the dock. When it’s getting close to your turn, take your leashed dog and your dog’s throw toy to the back of the dock. There will be a wrangler there to let you know where you are in line, and when to go up on the dock for your jump. Once you know your place in line, be sure to allow for ample space between the team ahead of you, and the team behind you. When you are next in line, be sure not to approach the steps to the dock until the previous handler’s dog is out of the water, and clearly leashed and under control. You will then have one jump. Once your dog’s jump in complete, and you have them leashed, you then return to your spot in line for a second jump. The longer of the two jumps is your official score. Each wave of the event will have ribbons or medals for all competitors, no matter where your dog placed in the wave. Even if your dog didn’t jump, you will receive a participant ribbon. After the wave is completed, be sure to stop by the admin tent after your wave to pick up your ribbon or medal. Speed Retrieve and Extreme Vertical are “All in one Finals,” which means they take the top 3 in each division after all competitors have gone. There are two formats for Big Air Finals: National format (used at national events) and Divisional format which is used by some of the clubs (club events may also use the National format). After all the waves are completed, the top six dogs from each of the Divisional Format Divisions move on to the finals. After all the waves are completed, the top six dogs from each of the National Format Divisions move on to the finals. We hope to see you on the dock!